The tree stands along a sidewalk in our neighborhood. I had to set my chair right in the middle of the walkway to capture the entire tree. When I stood in front of the bear face for the close up, a delightful Fox Squirrel peeked from behind the tree. It was quite curious about the human standing there. At one point I thought it was going to leave the tree and inspect me up close! Our lowcountry weather has been so absolutely balmy this November and December as compared to the last two years. We really need a freeze. Our early spring wildflowers are thinking it's time to bloom! How cool! I often "see" spirits in trees and I know the Native Americans used to believe there were tree spirits of other creatures that had died nearby. I haven't seen a fox squirrel in forever—they are the neatest animals! Sounds like a super fun time sketching! p.s. the word capture was "anatall." Rather appropriate given the tree! 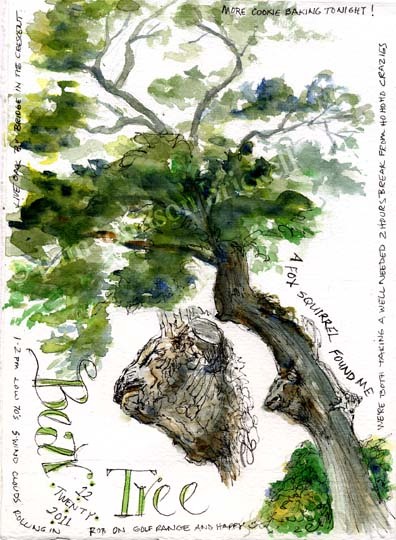 Very nice journal page and fun story about the Bear face in the tree. You captured it well. I also want to let you know that I am THRILLED with my new calendar, it arrived yesterday. So special - I will enjoy it all year long! Thanks, Laure! I remember talking about this tree with you over coffee :) The squirrel really surprised me. We only have a couple in our neighborhood and not usually near this area. He was very cool! Ha ha... great word capture for this post! Nice sketch as usual. Have a happy new year. Thank you, Joan! You have a happy and blessed New Year, too! ...I see a bear! How cool! Glad the little Fox Squirrel visited with you while you sketched! I'm sure that made it all the more enjoyable.